Jack "The Assassin" Tatum, a former Oakland Raider defensive back who happened to be involved in one of the most memorable plays in Steeler history, has passed away at the age of 61 due to a heart attack. Tatum, a ferocious hitter who once paralyzed New England's Darryl Stingley in 1978, collided with Frenchy Fuqua on a pass play in a 1972 AFC playoff game, with the deflected ball falling into the hands of Franco Harris. Harris scampered for a touchdown, the Steelers won the game, and the Immaculate Reception was born. 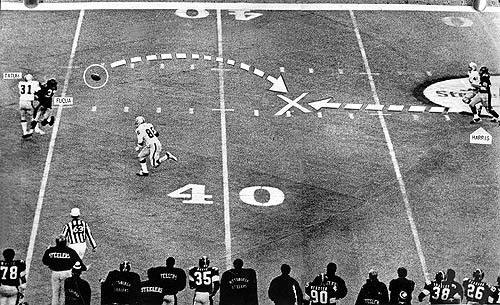 The play was voted as the greatest of all time by NFL Film, and it also happened to be the first playoff win in Steeler history. Incidentally, it also kicked off the "Al Davis vs. the NFL" rivalry that continues on to this day, but that's another story for another time. The Steelers would go on to lose to the undefeated Miami Dolphins in the AFC Championship, but the Immaculate Reception game kicked off a fierce rivalry between the Raiders and Steelers that defined the anything-goes, 1970s-era NFL. The teams met in each of the next four postseasons, with the Steelers going past the Raiders twice in AFC Championships en route to the Super Bowl. If you need a refresher on how tough Tatum was, take a look at the YouTube clip below. Tatum would more than likely be broke from paying so many fines had he played in today's NFL, which would probably be directly opposed to the "Assassin" style. Tatum was a very polarizing player, and while he was certainly disliked by many fans, he will certainly be missed by others. I guess hell needed some help in the secondary this season. I know that the settled obit. line for Tatum is "tough and aggressive, but not dirty". And that would in accurate. Tatum and his fellow thugs in the Raider's secondary routinely took headshots, cheapshots and were proactive in their zeal to knock WR unconscious. Oh yeah, he paralyzed Darryl Stingley as well. RIP Jack Tatum, but you didn't belong on a professional football field. Dammit, I meant to say "...And that would be INaccurate". Kind of kills the whole point of my post to get that wrong. Yeah, he was tough as hell whistle to whistle, but... he was dirty from that end of play whistle until the next whistle too. He never ever apologized to Darryl Stingley. The guy there were interviewing at the end was right though... if Jack Tatum is the #6 most dangerous player... who's #1-5? Rae Carruth? Donte Stallworth? Leonard Little? Who else in the NFL alumni has killed a human being? Ray Lewis got an assist. Plus, there's that O.J. Simpson guy, too.